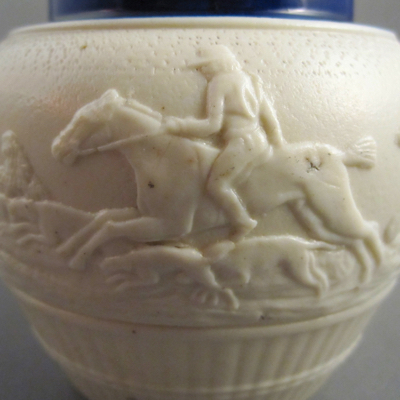 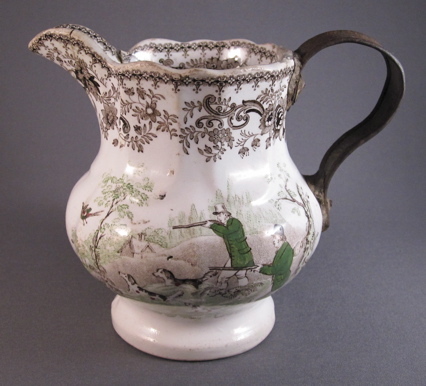 This Dutch shape stoneware jug with a moulded fox hunting scene was made in Staffordshire, England, perhaps by Chetham and Woolley. 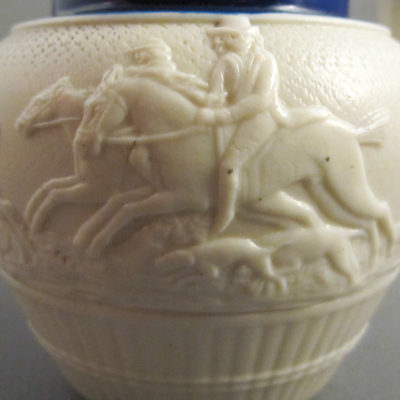 It dates from 1810 to 1830. 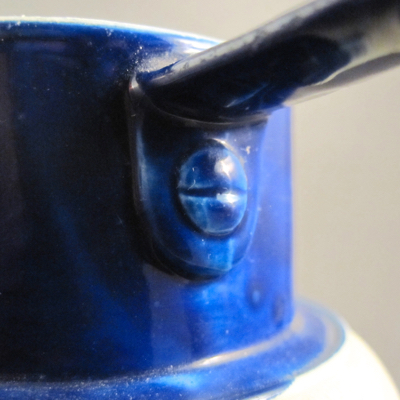 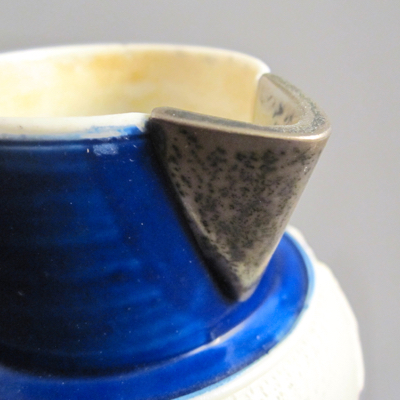 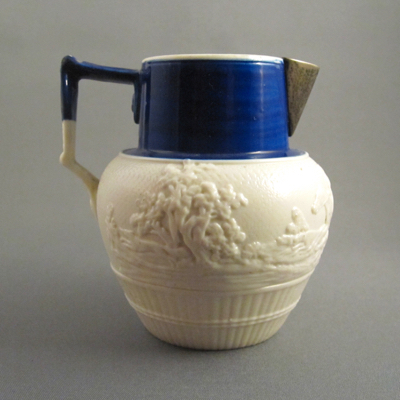 The top portion is glazed in cobalt blue and the lower portion is unglazed. 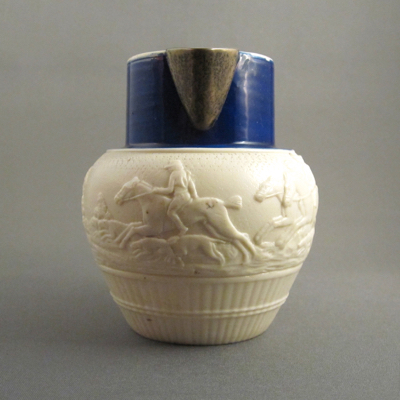 It measures 3.5 inches high and is unmarked. 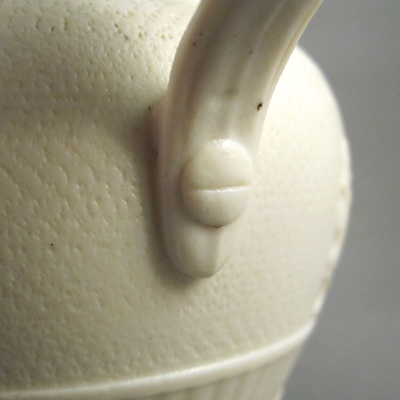 I particularly like the molded screws on the handle. 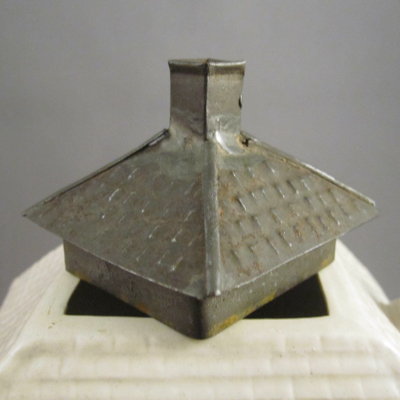 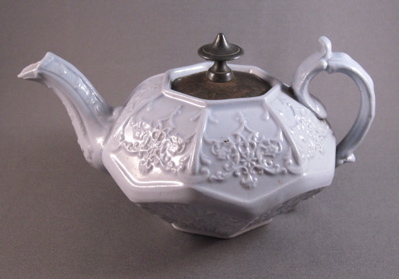 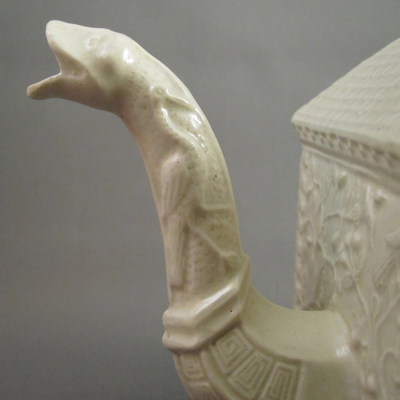 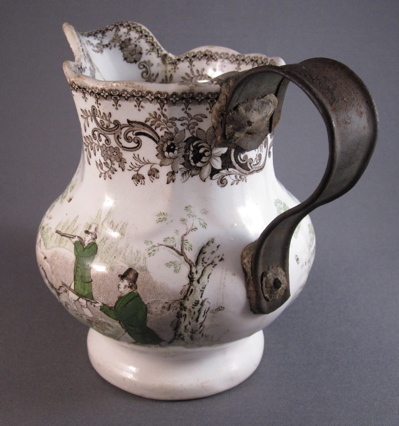 After the spout became badly chipped or broke off entirely, the jug was taken to a silversmith, who created a silver replacement spout. 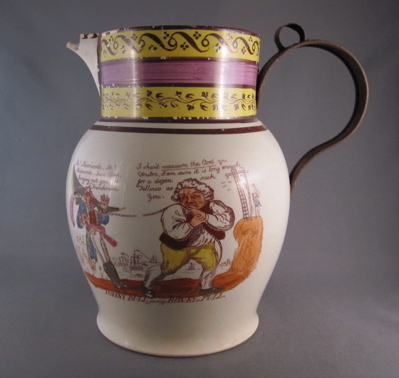 Though a bit squatter than the original most likely was, it is well made and more importantly, allowed the jug to function once again. 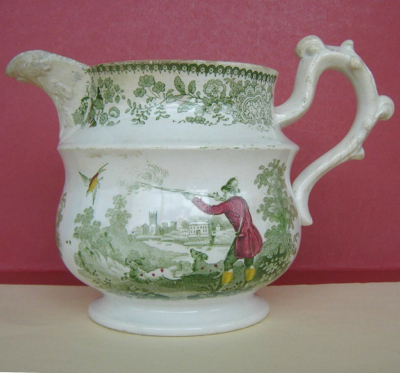 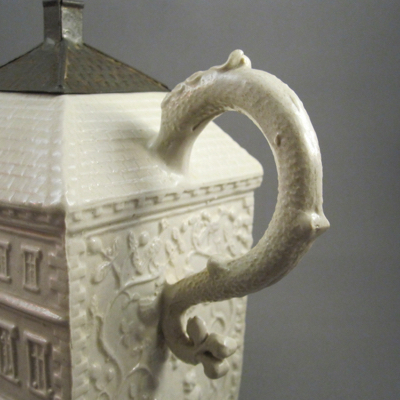 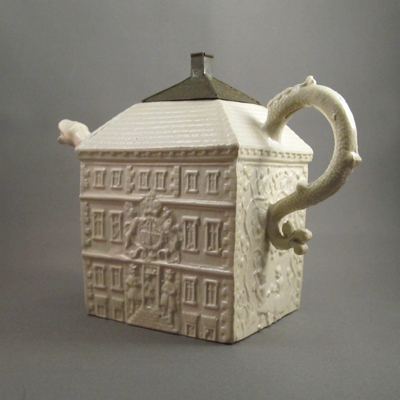 This jug of similar form shows what the original spout on my jug might have looked liked. 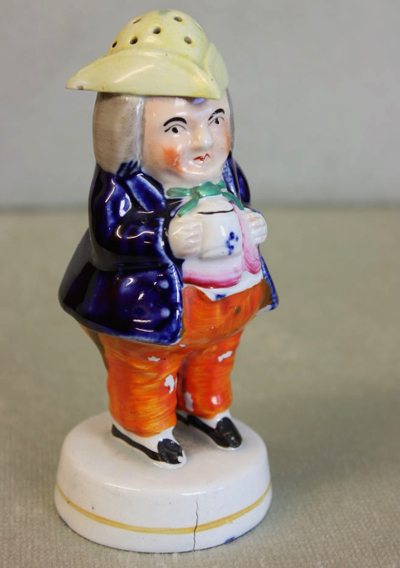 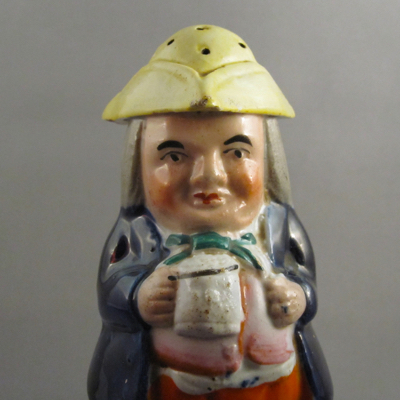 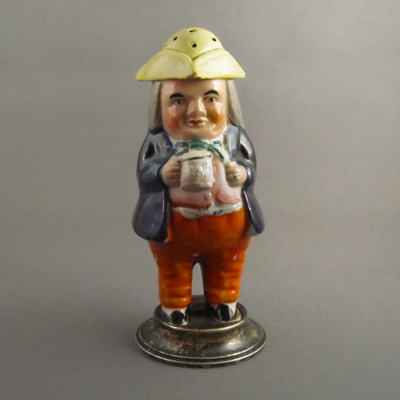 This 5 inch tall figural pepper pot (also known as a caster or muffineer) in the form of Sir Toby Philpott, wears a tricorn hat and grasps a tankard of ale in one hand and a tobacco pipe in the other. 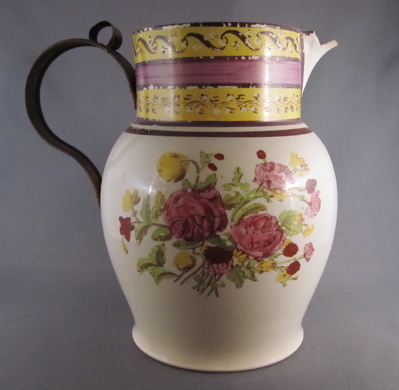 It was made in Staffordshire, England, in the late 1800s, of polychrome glazed pottery and is part of a four-piece caster (also known as a cruet or condiment) set, which includes a mustard, salt, and vinegar. 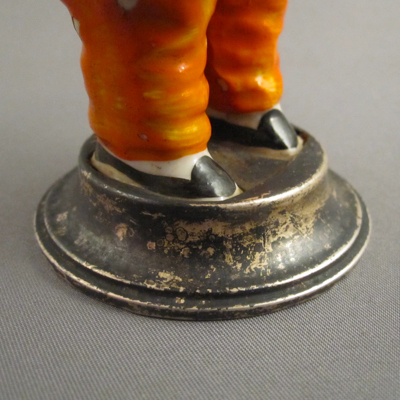 This Toby originally stood on a round plinth base, which he jumped off of (or fell, or was pushed) at least 100 years ago. 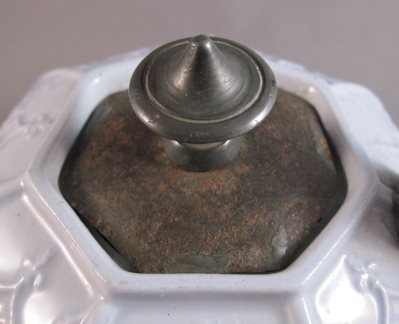 In its place is a nicely crafted silver replacement base, lending an air of elegance to this robust fellow. 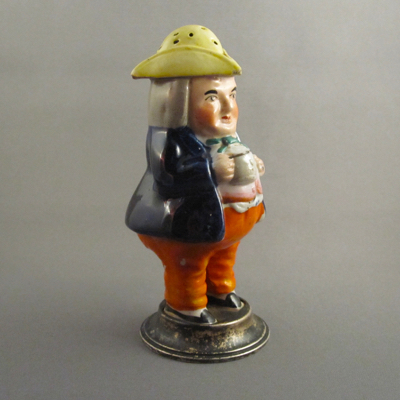 This chap stands on his original base, although the crack at the bottom leads me to believe that he might be heading to the silversmith soon to be fitted for his own silver replacement base. 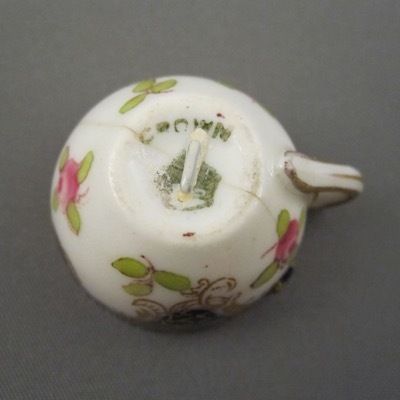 This is the one of the smallest antiques with inventive repair I have ever seen. 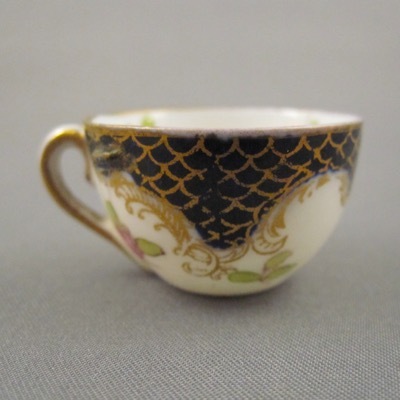 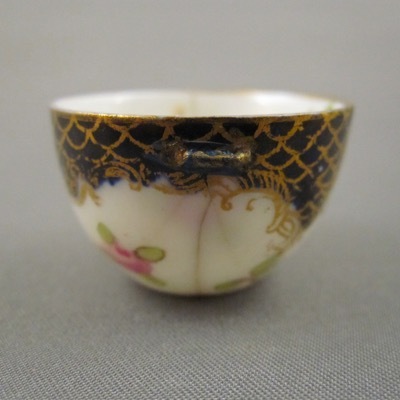 Made in England by the Crown Staffordshire Porcelain Co. Ltd. in the early 1900s, the cup is a mere 3/4 inches high and the matching saucer has a diameter of just 1 inch. 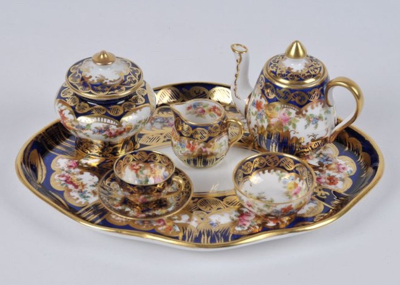 Both are decorated with pink flowers on a cobalt and gilt ground. 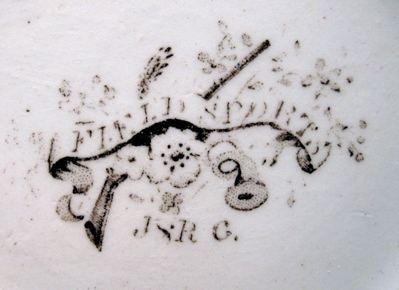 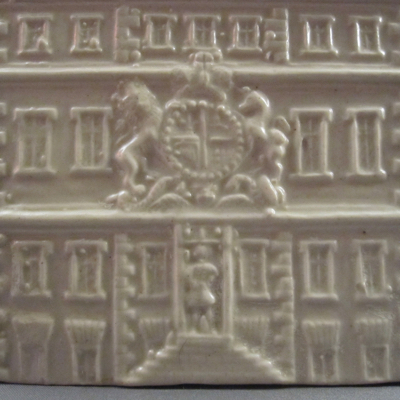 The cup is stamped in green on the underside CROWN above the image of a crown. 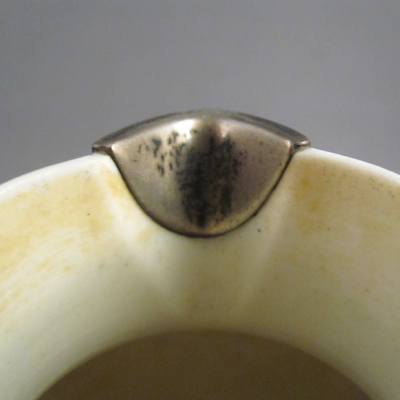 The same mark is barely visible on the underside of the saucer. 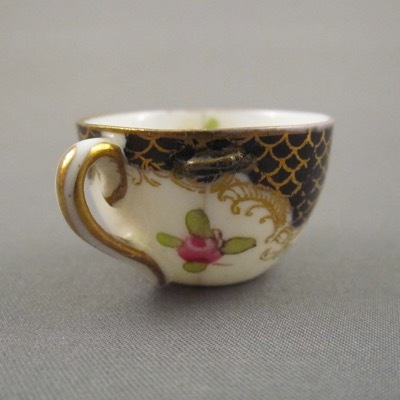 The smallest of the 3 metal staples on the cup measures a mind-boggling 1/8 of an inch long. 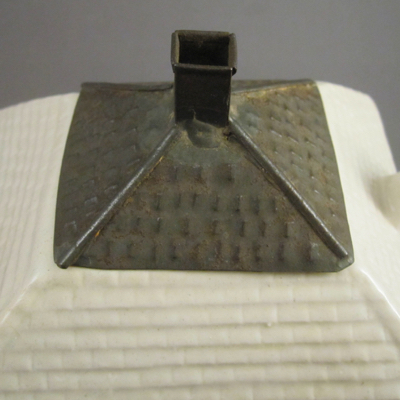 After the staples were applied, they were painted over to blend in and appear less offensive. 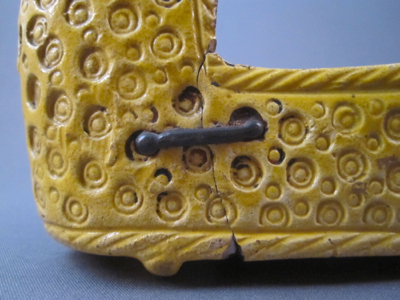 I can only imagine the precision and skill needed to make this delicate repair. 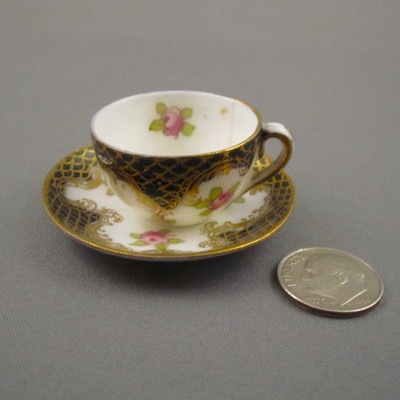 Here is an entire miniature tea service also made by Crown. 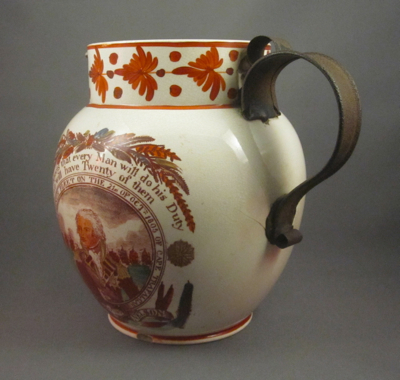 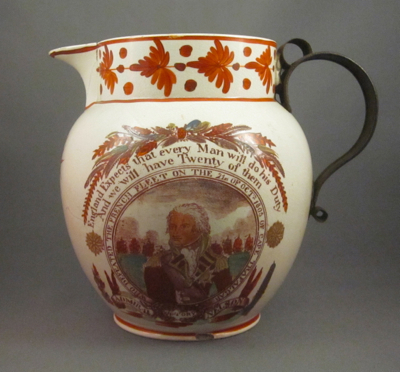 This colorful “Dutch” shape jug with transfer decoration and overglaze washes was made in Staffordshire, England to commemorate Vice Admiral Horatio Nelson, who died in battle at the Battle of Trafalgar in 1805. 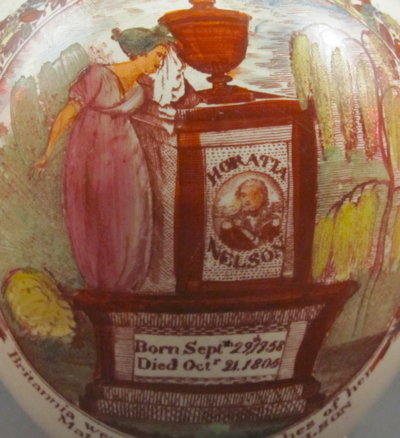 After he was killed by a French sniper, Nelson’s body was preserved in brandy while being transported by ship back to England for burial. 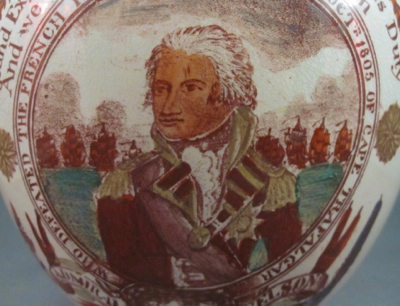 Nelson become one of Britain’s greatest war heroes and is memorialized by many London monuments, including Nelson’s Column in Trafalgar Square. 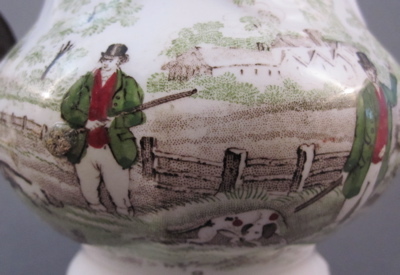 In 1797 during the unsuccessful Battle of Santa Cruz de Tenerife, Nelson tragically lost an arm. 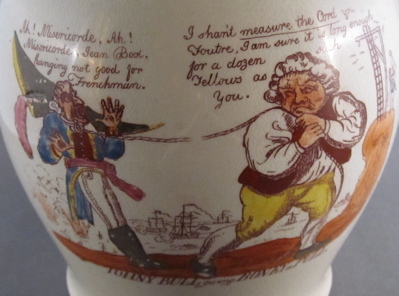 The ship’s surgeon, James Farquhar, wrote in his journal: “Compound fracture of the right arm by a musket ball passing thro a little above the elbow; an artery divided; the arm was immediately amputated.” Legend has it that within 30 minutes of treatment, Nelson was back in battle commanding his troops. 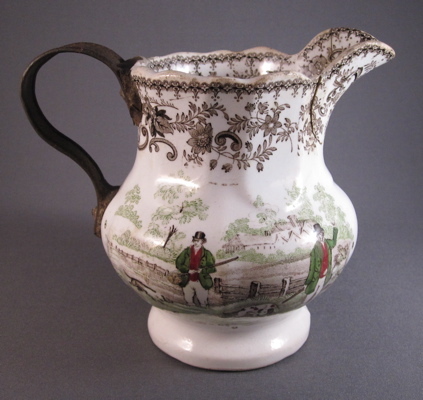 It seems this jug, too, has been to battle, as sometime in the mid-1800s it’s original handle snapped off and was replaced by a metal one. 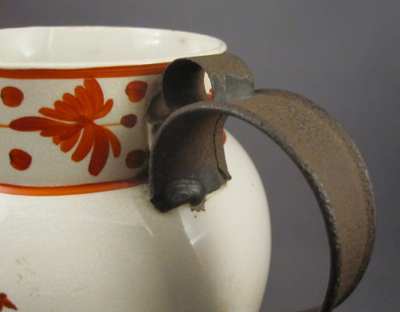 The itinerant tinsmith did a fine job fashioning a simple yet sturdy loop handle with thumb rest and small flourish at the bottom, which might have been his signature embellishment. 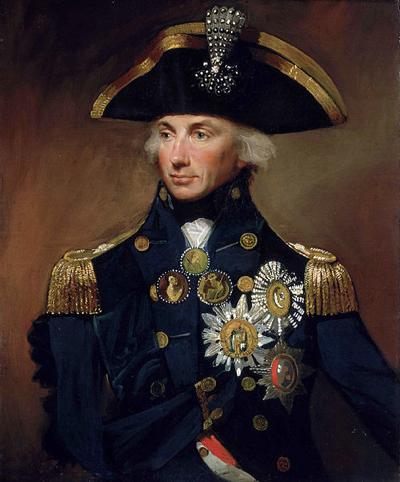 It’s a shame that Lord Nelson couldn’t find a replacement for his own missing arm, as seen by the empty draped sleeve in his famous portrait by Lemuel Francis Abbott. 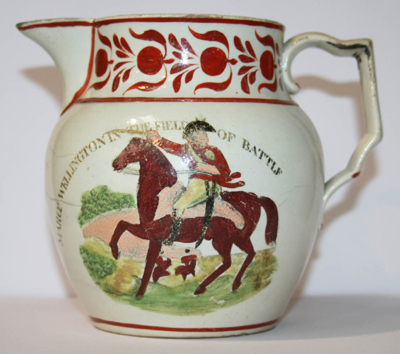 This jug, also commemorating the death of Admiral Nelson and with similar form, shows what the handle on my jug might have looked like before it was wounded in battle. 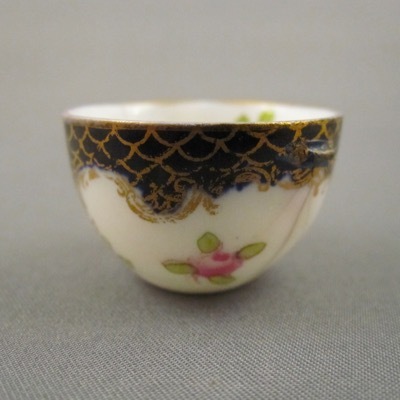 Miniature pottery cradles were a popular form of wedding gift throughout the UK during the late 17th to mid-19th century. 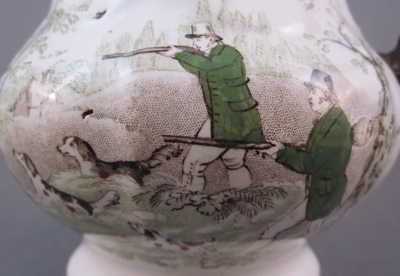 The not-too-subtle message to the newlyweds was to encourage fertility. 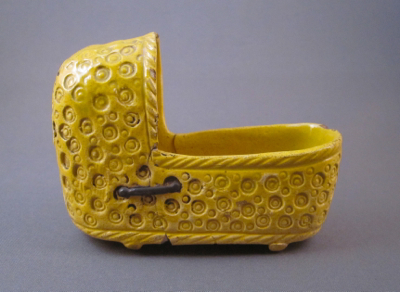 This humble example, measuring 3″ high by 3-3/4″ long, is made from yellow glazed pottery and decorated with an incised circle pattern. 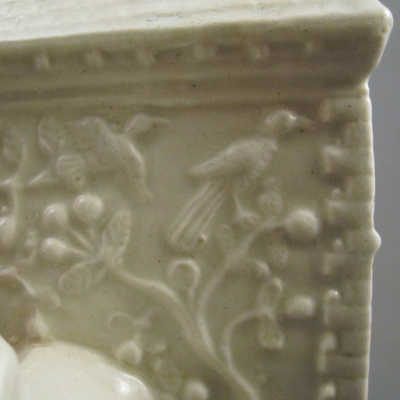 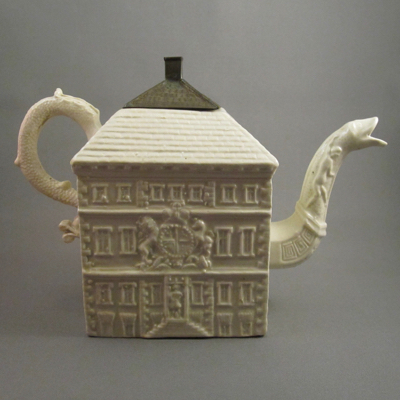 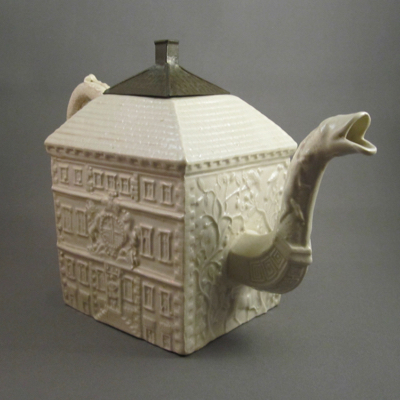 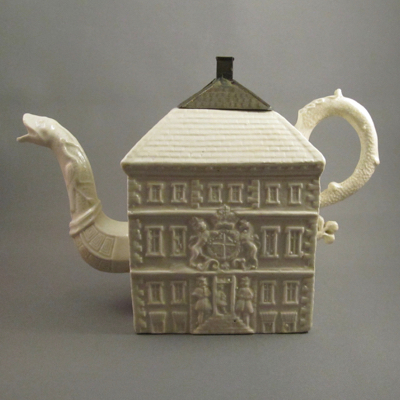 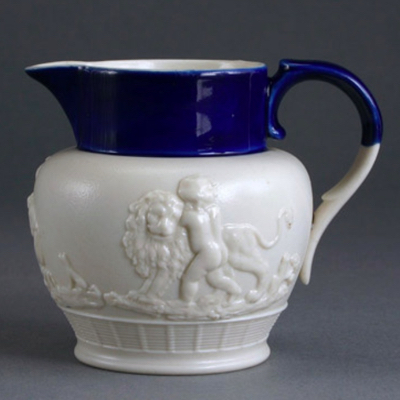 It was made in Staffordshire, England, in the early 1800s. 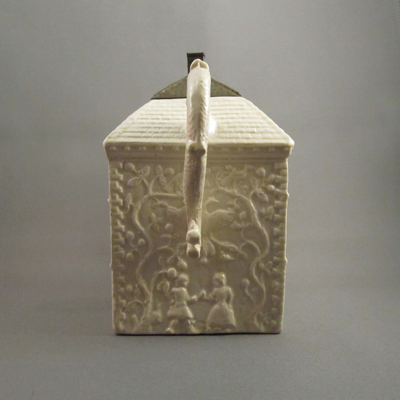 Perhaps after the young couple took the hint of the cradle’s implied message and had a child, the little darling grew up and one day broke the cradle. 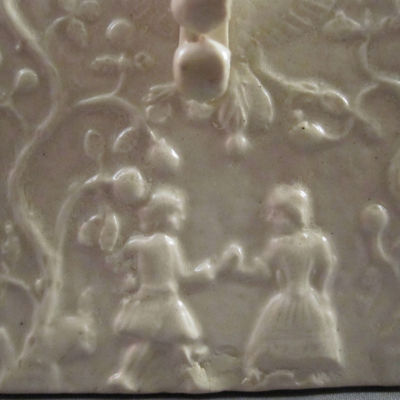 But one can’t blame the child who simply thought the cradle was a toy to be played with and not a symbol of its own mere existence. 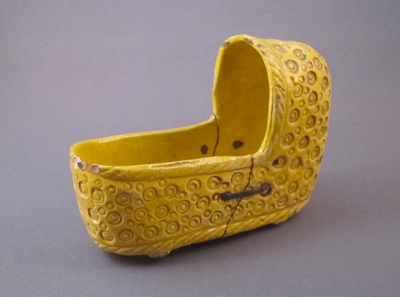 Distraught over their broken gift, the couple took the two halves to a china mender who repaired the cradle using two 3/4″ metal staples. 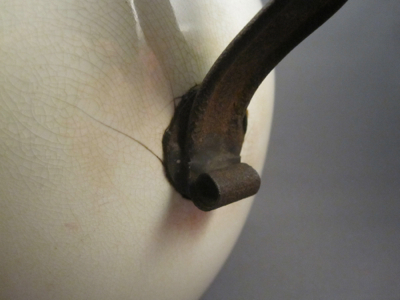 Although the cradle is back in one piece and suitable for displaying, the obtrusive scars bear witness to the unfortunate event. 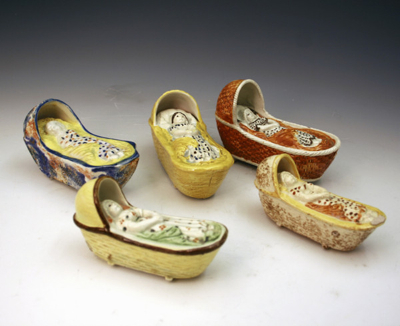 This grouping has similar cradles with molded babies in swaddling, rarer than my empty one. 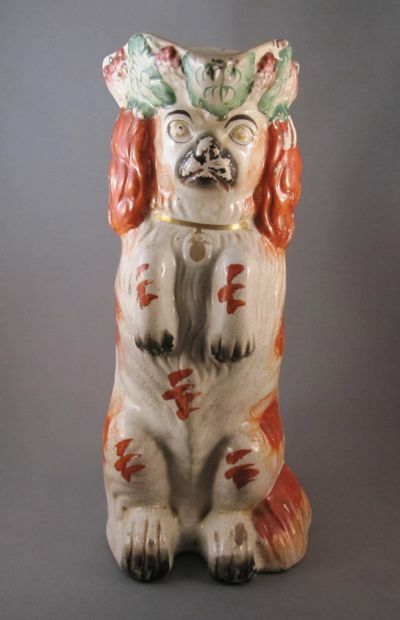 Whimsical “begging” King Charles spaniel with tricorn hat pottery jug, made in Staffordshire, England, in the mid-1800’s. 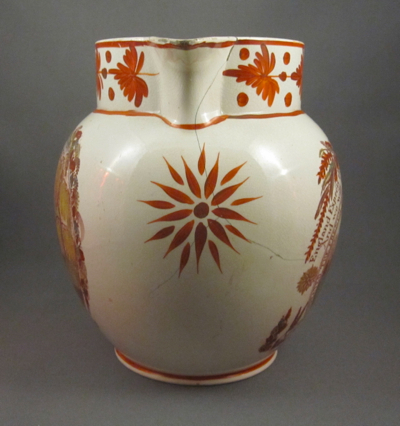 Painted in iron red overglazed decoration with a fruiting vine molded rim and a gold collar. 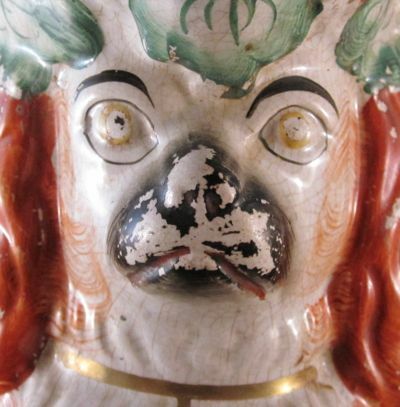 …leaving this poor pooch looking a bit sad. 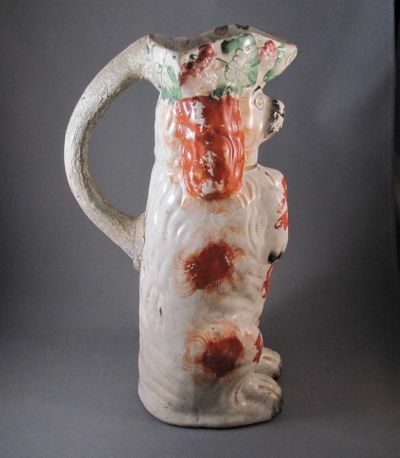 The previous owner of this jug purchased it in Zaire in the early 1980’s, where its missing handle was repaired with a crudely made clay replacement. 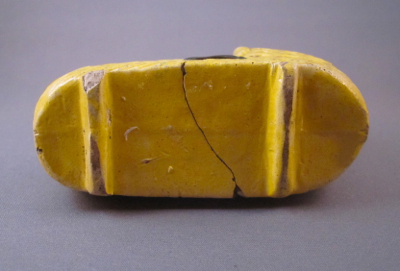 I have seen many extraordinary indigenous repairs on African masks, bowls, baskets and even tiny beads. 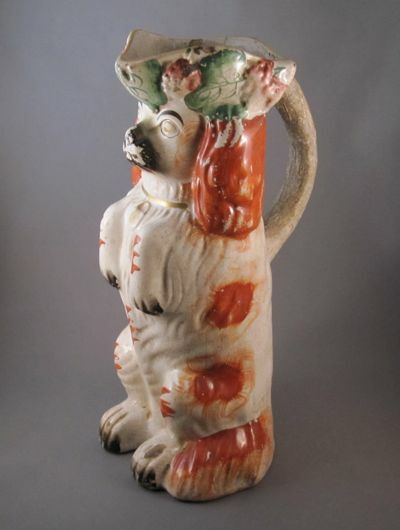 This happy pup stands tall with paint intact and its original pottery handle. 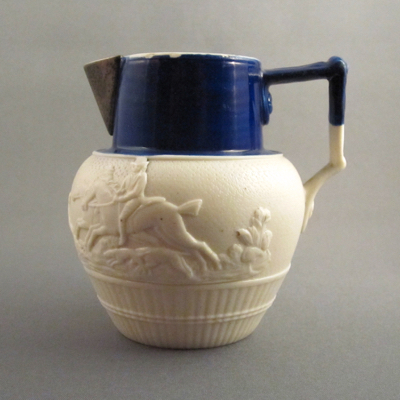 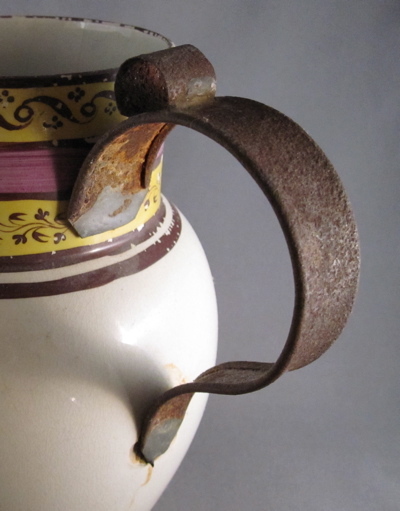 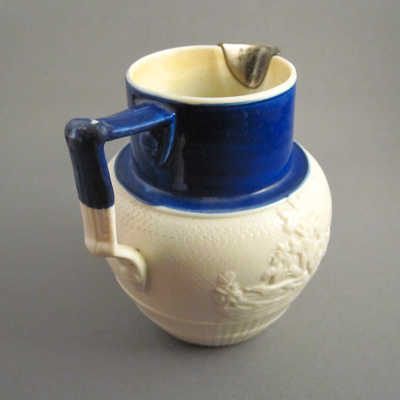 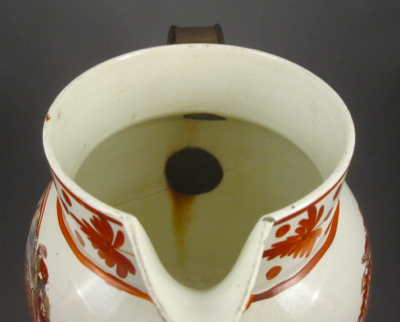 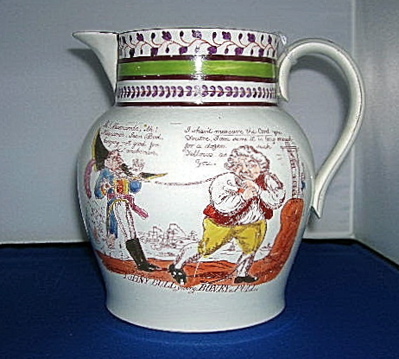 A pottery cream jug made by John Ridgway & Co. in Staffordshire, England. 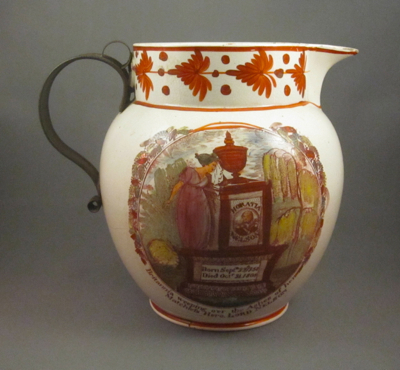 The transfer printed decoration in brown & green is highlighted with red and green overglaze washes. 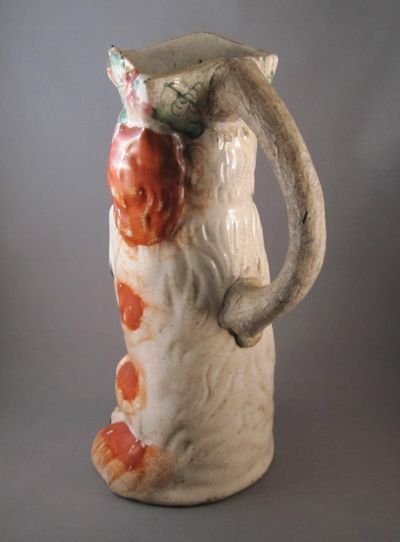 This piece almost did not make it in to my collection. 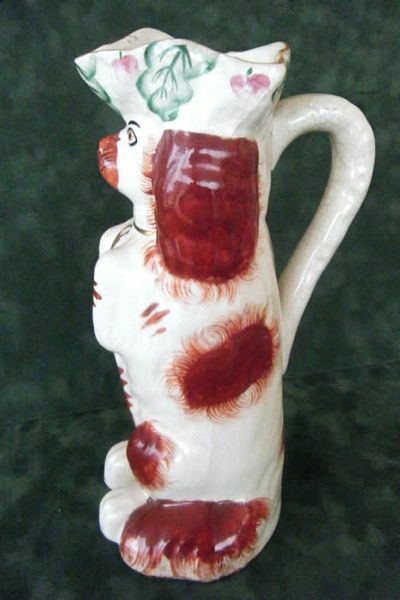 During my last trip to London in the spring of 2009, I saw the jug at an unattended market stall. 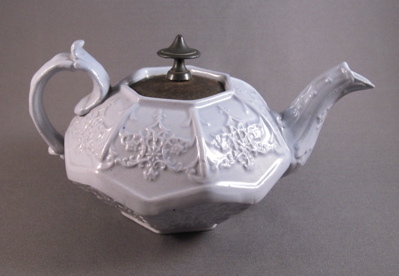 Each time I went back to try and find the dealer, he was nowhere to be found. 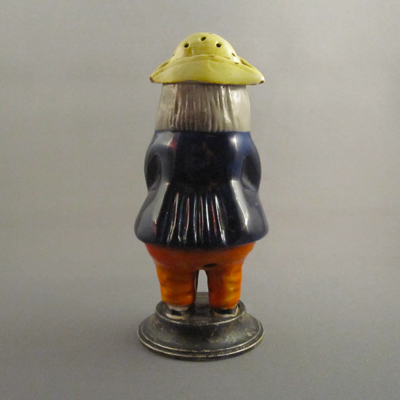 I almost gave up, but finally with the help of his neighbors, I tracked him down. 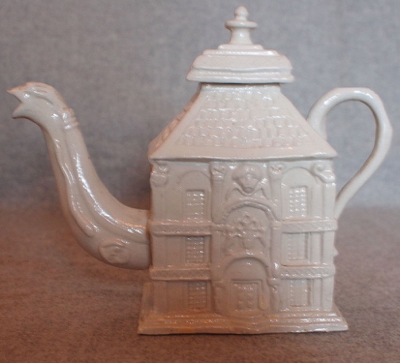 Luckily, the price was right and after all of the effort, I had to buy it!